In late January my wife and I took our kids to Disneyland. We planned 2 days in the park, both with park hopper passes so that we could bounce between Disneyland and the Disney California Adventure Park. The flights fell nicely into place (SEE: Turning 20,000 Amex points into 25,000 Alaska miles and $500). And our lodging was some place I never thought I would ever be: the Disneyland Hotel Frontier Tower. When I was initially planning the trip, the lodging that made sense (to me) was a ways from the park. I had a couple options in mind on points. Since we were a party of 6, we needed some real space to be comfortable. I had all but settled on the Homewood Suites by Hilton Anaheim Main Gate Area. It would completely clean us out of Hilton points, but at least we would only have to book one room! But this wasn’t going to fly. We had invited my mother-in-law since she loves Disneyland, and it would be nice to have some extra hands to help with our three kids. What I had forgotten was that she had started saving some Disney points for taking her grandkids to Disneyland someday. Well..that day came sooner than expected. Long story short, we didn’t end up booking the Homewood Suites. She decided to stick all of us in adjoining rooms in the Disneyland Hotel Frontier Tower! We got the best of all worlds: I didn’t have to pay or shell out points, and we were super close to the park. Not to mention the property has some great amenities. We flew into John Wayne (Orange County) airport which is a much better choice than LAX for visiting Disneyland. I hope I never, ever fly into or out of LAX again after my last time departing from there. It’s the worst. I’d take a connection. But a departure? Forget it. But I digress. John Wayne is way more convenient, about 25 minutes from Disneyland, and there was no traffic the day we arrived, so our Uber to the Disneyland Hotel made great time. Upon arrival, we all piled out and into the lobby. The first thing to greet us was a giant map of the Disneyland Park. The rest of the lobby had plenty of Disney fun, so the kids were entertained as grandma check us all in. Unfortunately for them, these teacups didn’t spin. One comment on check-in: there were no queues, and a reasonable number of people waiting for the front desk. No one really knew where to line up, and so we awkwardly stood around until we figured it was our turn. Our keys had our names printed on them, which is a first for any hotel with which I’ve stayed. We had to show them at several points (such as entering the pool area), but never with ID to match. Not sure what the point is, except for the coolness/souvenir factor. The Disneyland Hotel Frontier Tower is located across the pool area from the Fantasy Tower, so we had to walk a bit. It let us see the grounds. In front of each tower is a sign with its name. If you didn’t already guess this, each is named for a section of the Disneyland Park. The Disneyland Hotel Frontier Tower very appropriately has a giant model of the Big Thunder Mountain ride in the pseudo-lobby (is it called a lobby if there is no front desk?). Beyond that are the elevators, of which there are 4. Once we got to our floor, we were greeted again with “Disneyland Hotel” written in the carpet. We took in the view of the California Adventure park from a window near the elevator. Unfortunately, our room didn’t face the same direction. Our rooms were on the 9th floor of the Frontier Tower. The numbers were 2794 and 2796. I’m not sure how they got assigned those numbers. It would make more sense to me number them by tower number first (maybe 1 for Fantasy, 2 for Adventure, and 3 for Frontier), then by floor. My math-y brain tried to reconcile 27 as 3×9 (third tower, ninth floor). But that would just be a confusing way to number the entire property. Anyway, our adjoining standard rooms of the Disneyland Hotel Frontier Tower were quite nice. The door opens into a front area that contains a closet, a desk, and the door to the bathroom. There were bathrobes in the closet. These got some good use during our trip. I wonder how many the property loses, and/or if they charge guests if they take them. The adjoining door is between the desk and the closet. The beds had an awesome Disney-themed headboard. Really, there were Disney touches everywhere. My mother-in-law mentioned that the previous time they stayed here, there was very little Disney about the Disneyland Hotel. One of the coolest features was the fireworks above the beds. There was a switch on the lamp between the beds that would illuminate them and turn on some brief music. The kids enjoyed this immensely. You can even see the “hidden” Mickey in the fireworks. The room also contained a dresser combined with the coffee area and TV stand. In the corner next to the window was a couch. In the bathroom there were a number of Disney touches, most notably the lighting help by Mickey hands. Walt himself delivers the Disney-branded bathroom amenities. There wasn’t much Disney about the shower, though, aside from the Mickey ears on the stainless steel handle. Overall, the rooms were spacious, comfortable, and had all the amenities we needed (including a fridge) for our stay. We requested a crib for our toddler, which gave us all the space we needed for the six of us to sleep comfortably. The three adults were in one room, each of our older kids had their own bed, and our youngest was in the crib. We kept the doors open much of the time between the two adjoining rooms, and it was wonderful to have a bathroom we could use without disturbing the kids during the night. At nights we would put the kids to bed and then stay up another couple hours to plan the next day. Or we would just talk about how exhausted we were and then go to sleep early. Our adjoining rooms had nice views of the pool area and the other towers of the Disneyland Hotel. We couldn’t really see much of either park beyond Space Mountain and half of the Matterhorn. But the ninth floor is still a great place to be. One of the beds in each room is close to the window and provides a good view at night. We even had views of downtown Los Angeles off in the distance. The weather was a bit chilly, but overall super clear and nice the entire time we were in Orange County. I was surprised we could see the city. There definitely wasn’t a trace of smoke left from any wildfires. One of the best parts of staying at the Disneyland Hotel was the fantastic pool complex that the hotel contains. In the area between the towers, there are a total of two swimming pools, two large hot tubs, and a waterslide area. The largest pool is closest to the corner between the Adventure Tower and the Fantasy Tower. From my observation, it was the least frequented. Under the footbridge was the second, smaller pool. Our kids loved the pools. But they loved the waterslides even more. There are two waterslides, both of which are designed to resemble the iconic Disneyland monorail. The air was a bit nippy while we were there, but the pool water is nicely heated, so it was plenty comfortable for them to spend hours playing, even if they were in and out of the waterslides. The other two slides were taller. The shorter one had a single turn, and you didn’t pick up much speed. The taller one emptied into a dedicated pool and was much longer. The older kids did it again, and again, and again. Sometimes, however, there was a reasonable line and a wait of 5+ minutes. Lifeguards monitor everyone using the pools at all times, which is immensely helpful as a parent. Since we had all Sunday to kill before Monday and Tuesday in the parks, the kids took full advantage of the pool facilities. We even came back during the evening after our first day in the park to enjoy them some more. The waterslides are closed at this point. I believe they close at 5:00 for the day. The rest of the pools were open 9:00 a.m. to 9:00 p.m., although they probably change depending on the day and season. 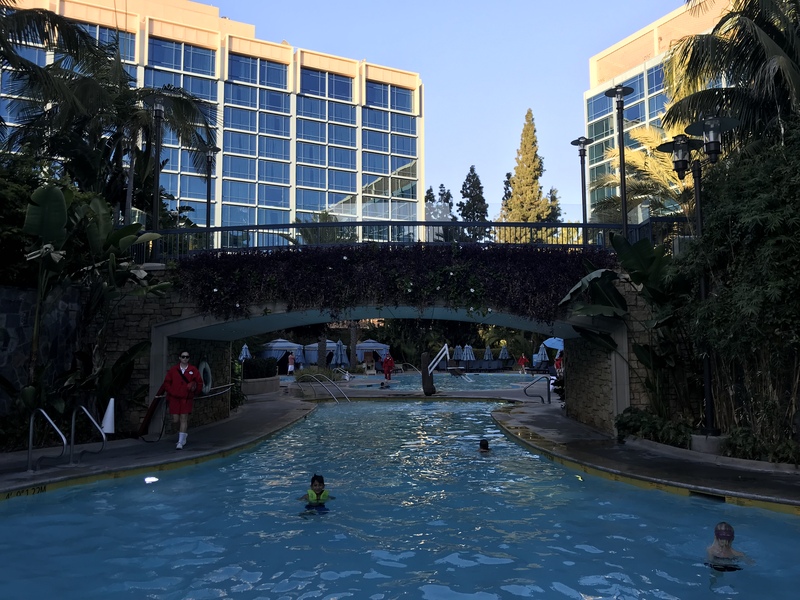 One thing to note: even though all Disney properties are fairly close to each other, staying at the other properties doesn’t give you access to the pool facilities at the Disneyland Hotel. So keep that in mind if you plan to hang out for a day and want your kids to be able to enjoy the pool. We didn’t really explore many of the other facilities. Plenty of adults were lounging poolside with drinks from Trader Sam’s Enchanted Tiki Bar in hand. I did get a Dole Whip float at the coffee shop next to Goofy’s Kitchen, but passed on the shot of rum. Admission to a character breakfast isn’t included if you’re staying at the Disneyland Hotel, but the proximity is nice. We were within a short distance of Goofy’s Kitchen, which is located near the pool areas in the middle of the towers. Our character breakfast experience deserves its own write-up. In short, the kids had a blast. All of the Disney resort properties are close to the park. But the Disneyland Hotel Frontier Tower happens to be the very furthest of them all. You’re technically a bit closer to the park entrances staying at the Best Western across Harbor Boulevard. But the Disneyland Hotel is still within walkable distance of the parks, and its even closer to the Downtown Disney district. We found the hotel very convenient overall. The last night our older two kids and I took the monorail back, which is hands down the best way to return from the park to the Disneyland Hotel. It dumps you at the far end of Downtown Disney, within sight of the hotel. One of the perks of staying at the Disneyland Hotel is the early entry offered to hotel guests, termed the “extra magic hour”. Depending on the day, extra magic hours may occur at Disneyland or at Disney’s California Adventure Park. Our first day it was at California Adventure, and our second day was at Disneyland itself. The benefit of getting in early is to hopefully hit a couple of your favorite rides before lines become cumbersome. This meant we headed straight for Radiator Springs Racers the first day. The “extra magic hour” benefit is available if you stay at any of the Disney properties, not just the Disneyland Hotel. But it was definitely one of the reasons my mother-in-law chose to stick us in the Disneyland Hotel Frontier Tower. All said and done, this was a fantastic option for our family. Yes, it would have cost us an arm and a leg if we had paid cash, and we would have never been able to afford it in our current situation. So it was an incredible treat. We were close enough to the park to easily walk, and we had some great facilities. It was also wonderful to have adjoining rooms so that we could put the kids to bed and have some extra space to talk and plan out the day. For someone who isn’t all that much of a Disney aficionado, I really enjoyed our stay in the Disneyland Hotel Frontier Tower.